Throwing a pie baking – and pie tasting – party for friends or coworkers, or to raise money for a favorite charity, are all delicious ways to celebrate National Pie Day on Monday, Jan. 23, 2012. Why is National Pie Day celebrated on Jan. 23 or 1/23? Because celebrating the wholesome goodness of pie is as easy as 1-2-3! Bakers of all skill levels are invited to enter the 18th Annual APC/Crisco® National Pie Championships® to be held April 27-29, 2012 in Orlando. Entry forms will be posted soon at www.piecouncil.org. Those who prefer to appreciate the nuances of pie without all the work won’t want to miss the APC Great American Pie Festival sponsored by Crisco®, featuring the Never Ending Pie Buffet, held April 28-29, 2012 in nearby Celebration, Fla. Here is a winning recipe from last year, courtesy of The American Pie Council. Mix all above ingredients in Kitchenaid style mixer on medium speed swiftly until crust appears “pea-like.” Carefully sprinkle water in crust mix until it starts to become moistened and gathers together. Pat into a disc, wrap and refrigerate for at least one half hour. Roll out on to floured surface and make and crimp crust. Freeze until ready to use. Cook above ingredients in large pan on medium heat until cooked halfway. Stir in 3/4 cup homemade caramel until melted. Mix above ingredients just until blended. Mix all together all crumb topping ingredients by hand or a pastry blender until fine and crumbly. Spread sticky toffee pudding mixture on bottom of crust. Put apple mixture over pudding mixture. Sprinkle with crumb topping. Bake in preheated 400 degree oven for one hour or until knife easily slides into center of pie with no resistance. If pie becomes too brown before done, turn down oven to 350 degrees to finish baking and cover with foil completely. Top with a generous amount of homemade caramel and praline pecans. In heavy 3 quart saucepan, combine all ingredients, but vanilla. Cook over medium heat, stirring constantly, covering all parts of bottom of pan with wire whisk to avoid scorching. Stir until mixture comes to a boil. Reduce heat to low and cook, constantly stirring, until mixture comes to a boil. Reduce heat to low and continue stirring until caramel reaches 244F on a candy thermometer or firm-ball stage. Pour in glass container. Cool to use. Melt butter in small pan on medium –low heat until melted. Add pecans and sugar and stir ingredients until you start smelling the nuts roasting. Take off heat and cool. Crumble. The American Pie Council® (APC), the only organization committed to maintaining America’s pie heritage, offers pie lovers plenty of reasons and ways to celebrate. The APC offers recipes on its website www.piecouncil.org and many APC members offer activities, specials and more in celebration of the special day. The APC is comprised of amateur, professional and commercial pie manufacturer members. Any amateur pie maker or pie lover can join for just $40 for a lifetime membership. Any civilization that enjoys bread has some sort of bread pudding. If you have bread, it stands to reason there will be left over bread. Until very recent times, nothing was wasted, and as most families kept chickens and either goats or cows for milk, there was also surplus milk, cream and eggs to be used up. Today, with the reliance upon supermarkets, and the ability to freeze bread until it is needed, along with the ready availability of milk and eggs in almost any quantity, we do not have as much left over bread, milk and eggs. That does not mean we can no longer enjoy bread pudding. But if you don’t have any left over bread, there is no reason to go out and buy bread to make a dessert. If you look in the back of the cupboard, you will probably find a collection of cookies, dessert cakes, and maybe even breakfast breads that seemed like a good idea at the time, but that the kids wouldn’t eat. The food was too expensive or you just thought it too wasteful to chuck it, but no one will eat it. So what do you do? 1. Break the cookies, breads, whatever you are using into pieces and fill up casserole dish. 2. Pour the milk over the top. 3. Use a spoon and lift the cookies a bit to allow the milk to soak in and to settle around the spaces. 4. Place the casserole in the over and set for 350° F for about 30 minutes. 5. Remove from the oven and allow the pudding to rest for about 15 minutes before serving. If you like, you can make a sauce to spoon over the top. A traditional sauce for bread pudding is rum or bourbon sauce. Since you will probably be serving this to your kids, maybe that is not such a good idea. 1. Using a wire whisk, whip the water and egg yolk together. Whisk in the lemon juice and sugar. 2. In a small pot, put a few inches of water and bring to a low boil. Place the bowl with the lemon-egg mixture over, not in the water, and whisk it constantly until the sauce begins to thicken. 3. Be careful not to allow the egg to cook. Otherwise you will wind up with scrambled lemon juice. Not good. You can vary the sauce by using orange instead of lemon juice, or half lime and half lemon juice. If you want some extra lemon flavor, put a little lemon zest over the top of the pudding one you spoon the sauce over the top. Best of all, you can serve this with a scoop of ice cream, and a squirt of chocolate syrup in the event lemon isn’t your thing. Puddings seem to have become a forgotten dessert. With the ease of whipping up the instant stuff, making pudding from scratch seems so antiquated and unnecessary to the modern cook. Puddings have been around for hundreds of years but haven’t always been considered desserts. The first sweet puddings date back to the Middle Ages and were made by boiling ingredients together until a thick, custardy mixture was formed. The same process is used today to make creamy, rich pudding. Before instant pudding hit the grocery store shelves, pudding was typically a dessert reserved for holiday meals and special occasions. The pudding making process can be tedious and labor intensive. Many recipes call for double boilers, water baths and many other complicated steps. This recipe is so simple and easy but yields the most decadent chocolate pudding far surpassing any instant variety. With the whole process taking approximately ten minutes and using readily available ingredients, why not serve this dish at your next dinner party and wow your guests with an old fashioned dessert that couldn’t be any simpler. Or delicious. 1. Combine sugar, cocoa powder, salt and cornstarch in medium saucepan. 2. Add the milk and stir until well combined. 3. Bring to a boil and cook, stirring constantly, until the mixture is thick enough to stick to the back of a metal spoon. 4. Remove from heat and add butter and vanilla. Stir. Serve warm or chill in the refrigerator. Whether you’re using a box of banana Jell-O filling for a cream pie or whipping up parfaits for dessert, the world of pudding includes much more than just the basic varieties of chocolate and vanilla. In the past, the most common way to prepare pudding was to mix ingredients with a grain product or other binding material (like flour, butter, eggs or cereal) to create a solid product. Nowadays, people boil, steam or bake creamy and thickened puddings from scratch. To create a new pudding, you may add tropical juices and other fruits to elevate the taste and texture of your recipes. For example, Fruity Bread Mango Pudding may contain Rubicon mango exotic juice drink paired with dried cranberries and mango. Around the holidays, candied yams and sweet potato pie are popular desserts. You probably don’t think of yams and sweet potatoes as creating satisfying puddings, but these healthy starches offer quite a taste and consistency with common ingredients, such as butter, brown sugar, lemon juice, grated lemon peel, and slivered almonds. Boiling water is used as a method of preparing steamed puddings, where cranberries, plums and apples serve as common ingredients. Known as a popular sweet treat in England, Devon’s Georgie Porgies Puddings offers two tempting steamed fruit selections: Orange & Cointreau (an orange flavored triple sec liquor) and Cider & Apple (contains West Country cider and apples). For a holiday twist, use canned or fresh pumpkin puree to create a steamed pumpkin pudding, which tastes heavenly with a whipped cream or brandy sauce topping. Take a page from Latin American and Caribbean cookbooks by preparing a rice pudding called “arroz con leche” (rice with milk). When preparing this sweet treat, the typical list of ingredients differ per country. In Chile and Mexico, the pudding contains raisins soaked in sherry wine or tequila. Colombians soak their raisins in red wine, rum or pisco – Peruvian liquor distilled from grapes. Anise seed adds a touch of licorice to the Cuban version of arroz con leche. In Peru, it is not uncommon to find shredded coconut or walnuts added to the pudding. This recipe is courtesy of Chad Carns, the author of “The Gourmet Bachelor, Global Flavor, Local Ingredients” cookbook — thegourmetbachelor.com. Thank you, Chad! 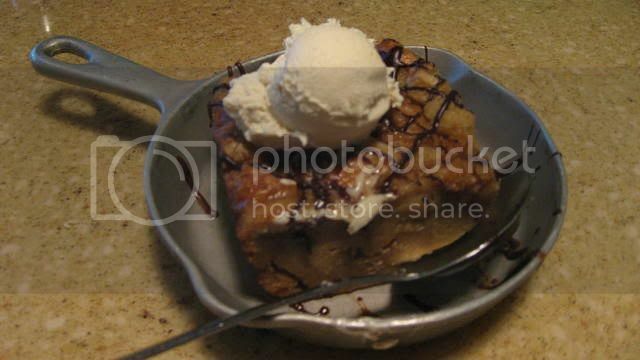 Bread Pudding: Preheat oven to 350 degrees. Mix milk, coconut milk, coconut flakes and bread in a large bowl. Whisk eggs, sugar and vanilla extract in a small mixing bowl and then add to bread mixture. Grease a 13 x 9-inch baking pan with butter. Spoon the bread mixture into the pan. Bake on the upper rack of oven until the bread pudding has set and is golden brown on top, about 45 minutes. Mango sauce: Simmer ingredients for 10 minutes. Remove vanilla bean. Blend in a food processor until smooth. Serve pudding on a bed of mango sauce.